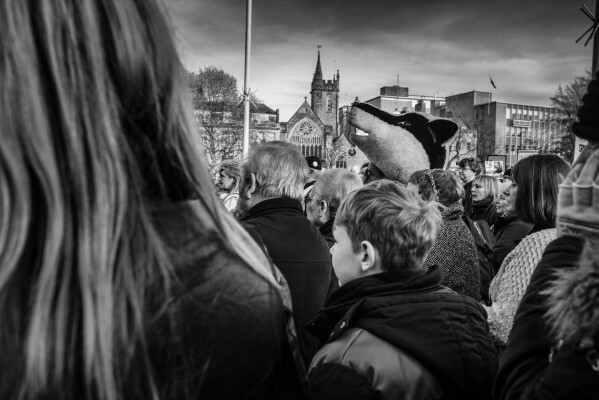 At one o’clock on the 30th of November 2013 on a bright sunny afternoon, hundreds of people bowed their heads in silence for one minute to remember the hundreds of badgers killed in the last three months during the Government’s pilot culls. At noon, the extension to the pilot cull in Gloucestershire had ended, revoked early by Natural England since the cull companies hadn’t been able to kill enough badgers to reach the Government’s revised target figure. Amongst the crowd were observers who’d seen and heard badgers dying in Somerset and Gloucestershire and can testify that many died, despite the Government’s protestations, inhumanely and, as so many scientists state, for no good reason at all. As the bell tolled out over College Green, the silence amongst the crowd was absolute. This was the latest march in a long string of protests against the cull that have been organized up and down the country by Dominic Dyer from Care for the Wild with the support of many other organisations. In Bristol, TV broadcasters, Simon King and Bill Oddie joined Dominic as the main speakers. Crews from Sky News and ITN covered the event though BBC Points West was conspicuous by its absence. Swagtail Films upheld Bristol’s reputation as the leading wildlife film making centre by producing a short film that captures the essence of the day. People of different ages and backgrounds came from all areas of the country from Pembrokeshire to West Sussex to register their concerns against the badger cull in public. Hard as I could try, I couldn’t identify them as the ‘rabble’ targeted by some agricultural journalists such as Chris Rundle in the Western Morning News a couple of days before. Speeches updated people on the Government and NFU’s latest manoeuvres to roll out the policy into more areas next year. And then the march into the city centre got underway. Placards were hoisted aloft whilst whistles and horns were blown as the march wended its way through the crowded streets. Children along the way took up the chant to ‘Save Our Badgers’ and ‘Stop The Cull’. These are trenchant messages that underscore the serious, informed opposition to a policy that has broken every method employed by the Randomised Badger Culling Trial yet still claims to be able to deliver comparable reductions in cattle TB, which were meagre to begin with. As the scant evidence base for the policy becomes increasingly undermined and the costs increase exponentially, it’s hard to imagine what justification the Government will use next to continue with this policy. However the latest statements from Mr Paterson and the NFU show determination to steam ahead regardless, which in turn only means that opposition to the badger cull will continue to grow and gather strength as we try to protect our largest terrestrial wild carnivore. Join Dominic and others at the next march in Shrewsbury. Meet at 13.00 at The Quarry Park, 1 St Chad’s Terrace, SY1 1RN to listen to speeches before marching through the Town Centre.